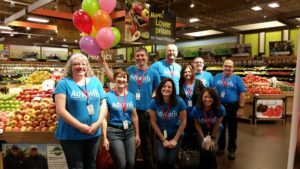 Store to Door’s volunteer-based grocery delivery service can be generously sponsored by your group, company, or corporation. 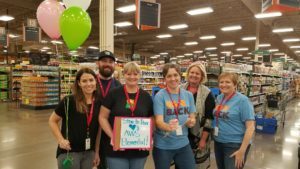 A one-time donation of $1,500 significantly helps off-set costs and directly impacts between 85-100 local seniors and people with disabilities, allowing them to receive their much-needed weekly groceries. 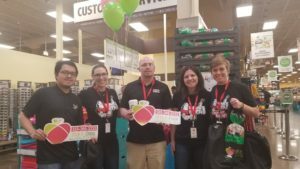 You can support one entire week of grocery deliveries and friendly visits for up to 200 homebound seniors and people with disabilities with a $5,000 sponsorship. Your sponsorship will have a direct impact on the lives of 100-200 Portland seniors and people with disabilities. It’s easy-to-implement and is a one-time commitment. It’s flexible and fun! 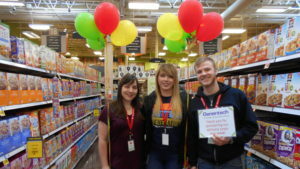 Choose any day or week to sponsor and bring a group to volunteer grocery shop and celebrate! 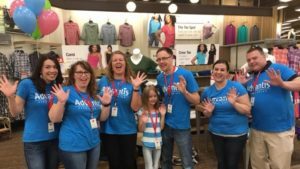 We’ll spotlight your sponsorship and volunteer day in Store to Door’s social media (Facebook, Twitter, LinkedIn, and Instagram), e-newsletters, website, and annual report. We’ll send press releases to local news outlets, sharing your generous involvement! 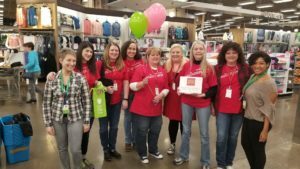 We’ll share the love, using signage and PA announcements at the Fred Meyer store where 6,000 – 7,000 shoppers visit every day! To learn more, please complete this Contact Form or call Amanda at 503-200-3333 ext 106.